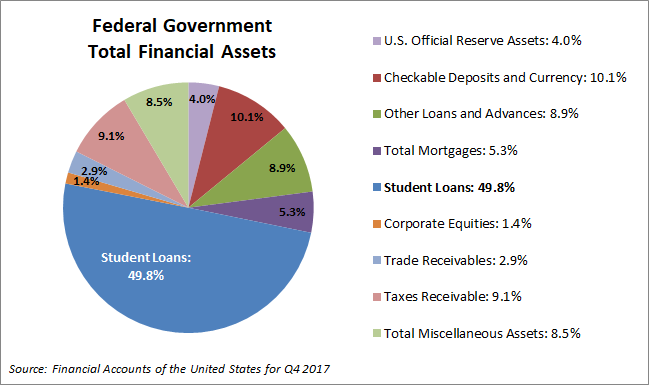 Half of Total US Government Assets Are...Student Loan Receivables?! Young liberal American, you might not consider yourself a true patriot, but when you take out a six-figure loan from the federal government for that Art History degree from NYU, you are helping to lay the very foundation of the federal balance sheet. A jaw-dropping 49.8% of all federal assets are student loans. And if you think that over $1 trillion in debt is coming back to the government in full, think again. Over 11% of loans are "seriously delinquent" (over 90 days behind, in the debt industry's "kiss it goodbye" bin). And this is with interest rates still near zero and a series of rate hikes to come. 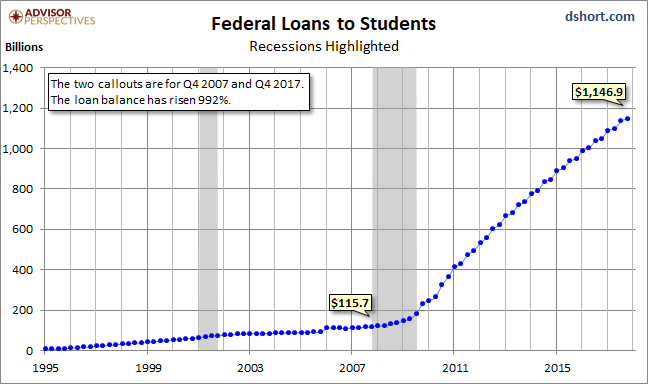 Student loans may be a liability on the consumer balance sheet, but they constitute an asset for Uncle Sam. Just how big? It's 49.8 percent of the total Federal assets. This is 9.5 times larger than the 5.3 percent for the Total Mortgages outstanding and 5.5 times the size of Taxes Receivable at 9.1 percent. As the cost of a college education has skyrocketed and the college degree has lost its luster, becoming the white-collar equivalent of a high school diploma, a greater percentage of American youth are taking on over $100,000 worth of debt before they have any real-world work experience or any practical idea of how long it will take to pay that off. Worse still, many are using that debt to get liberal arts degrees in fields that offer few new jobs and pay poorly, finding that they can make more money waiting tables (which they could have done four years prior to college, debt-free) than, say, teaching English.